The train chugged through the hills. It looked like a monstrous black snake, winding its way around and around the mountains with tight coils. Billowing smoke poured out of the funnel on top. Colin looked out the window and gazed silently at the trees, streams, and many stones. It had been a long trip for him from the city. He was starting to get anxious as the conductor had walked by and told him that it wouldn’t be long before they’d be stopping at the tiny village, Branach. He was hoping his Auntie Kathleen would be there waiting for him. The train came to a stop. The chugging slowed down until there was no noise at all except for the people trying to get off the train. Colin pushed his reddish-brown hair out of his steel blue eyes, picked up his bag and climbed down the steps. Auntie Kathleen was standing there with Duncan, his cousin. She ran up to Colin and hugged him. "Was it a nice train ride?" she asked, taking his bag from him. "It was long, but nice," Colin replied. "Hi, Colin," Duncan said. The boys hadn’t seen each other since last summer. Both had grown taller and looked very much alike, having the same color hair and eyes. "I can’t wait to show you my hideout. We are going to have so much fun," he said, smiling. Colin was happy to be there. He and Duncan got along very well and enjoyed each other’s company. "It’s very quiet here," he noticed as they walked towards the car. The train started back up and chugged up the hill. "Aside from the train, that is," he laughed. They got into the car and drove thru the hills towards home. Colin and Duncan sat in the back seat, talking away. When they got to the house, Duncan showed Colin where he’d be sleeping, which was in his room. Colin was glad for that. He unpacked his bag and changed into some clean clothes. Auntie Kathleen fixed he and Duncan a big plate of shepherd’s pie and gave them each a few gingerbread biscuits. "Let’s go to my hideout now, Colin," Duncan said, anxiously. "Is that all right, Mum?" he asked. She nodded yes. They ran outside. Colin looked around. The sky was bluer than he had ever seen. The clouds were puffy and white, and looked like mounds of cotton balls squished together. There were a lot of big gray stones, tall birch and oak trees and many flowers. Colin didn’t hear cars honking or people screaming like he heard in the city. He liked the quiet. They came to a small stream, trickling through the grass. Colin noticed the water was brown. He even saw small fish swimming in it. "Duncan, why is the water brown? Are there are fish in the water? Can we go fishing?" he asked. "You ask a lot of questions. The water is brown because it runs through peat, which is like the moor, or bog. Do you get it?" "I know what peat is, Duncan," Colin assured him. "We’ll fish tomorrow. I know a spot in the river just around the bend where we can catch trout and salmon, big ones too," he answered. "Wow. I can’t wait," Colin said excitedly. They walked through the tall grass. Colin noticed that the whole hillside seemed to be purple. "What are those purple flowers? They are everywhere?" "Heather. We have lots of flowers around here. There are bluebells near the house, and you can always find thistle, but they are prickly, so be careful," Duncan warned. "I will be," Colin said. "There are a lot of flowers in your garden. By the way, where’s the hideout?" "See that pile of stones over there? The big ones? That’s where we are going," Duncan explained. "There’s a cave in there. It’s very damp and there’s green moss growing on the inside, but I don’t think anyone’s ever been in there before." "I hope there aren’t snakes or big spiders," Colin said, concerned. "Let’s go find out," Duncan called out, running towards the cave. Colin ran after him. The two of them soon were standing at the entrance. "I’ll go in first," Duncan volunteered. "Go right ahead," Colin said, allowing him to do so. They went inside. It was cool and dark. "I brought a torch," Duncan said, pulling out a flashlight. He shined it around the cave. The boys walked back further. "What’s that?" Duncan said, walking quickly towards a pile of something in the corner. "I hope it’s not a dead body, or a snake" Colin replied. "Colin, look at this. It’s some kind of treasure!" Duncan bent down and picked it up. "Here, you hold the torch," he said, handing it to Colin. Duncan held up a helmet. "Wow, it looks like an old helmet from the days of the Highland clans!" He picked up another item. It was a brooch. "Look at this! It’s a brooch. It’s filled with jewels. I wonder if they are worth a lot of money?" Duncan handed Colin the helmet. He stared at it with amazement. He set it down and took the brooch. He was looking at it carefully. It had a thistle, with an eagle sitting on top of it. "Duncan, I think this is a historical artifact. What else is there?" he asked. "A historical artifact? It’s treasure. Let’s see what else there is. Shine the torch over here," he urged. "Wow, it’s a sword! Look at this, would you, Colin." Colin leaned over. "Wow. It is a sword. Look at the handle. It’s carved with Celtic symbols!" "How do you know that?" Duncan asked. "I studied it in school," he said, feeling somewhat proud. "The sword is shiny and made of steel or something. It must be a thousand years old. We’re going to be rich," Duncan cried out. 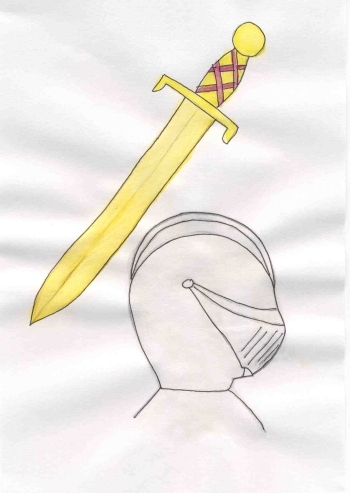 The boys gathered all the items, the sword, the brooch, the helmet, and several silver goblets and took them home to show Duncan’s mum. She called the curator of the museum and he came out to the house. The things the boys found in the cave did turn out to be very old and valuable. The curator took them, leaving the boys disappointed. They’d wanted the riches, but seemed to be pleased enough when he left them a reward. "Colin, now you have enough money to enjoy your stay here in Branach and still have enough to take home," Auntie Kathleen smiled. The next day the boys went fishing. Duncan caught three trout. Colin caught one. He didn’t mind. He was so excited to have caught one fish. Auntie Kathleen cooked the fish for supper that night. They were delicious. Colin spent the next few weeks exploring the hills and dales of the glen. He climbed trees. He milked a highland cow and learned how to sheer sheep. He helped plant and tend to the vegetable garden. When the flower garden needed weeded, Colin was the first to offer to help. He enjoyed the scent of the pink and yellow roses and bright red primroses. Duncan and Colin had many adventures as they walked through the woods and along the riverbanks. They even found some cave drawings. They had great fun! The time passed too quickly and Colin had to return home to the city. School was going to start soon and he needed to get prepared. Auntie Kathleen said goodbye to Colin at the train station and invited him to come back the following summer. Duncan hugged Colin. He didn’t want him to go. He liked having someone there to play with. "I’ll be back next summer," Colin said, wiping the tears from his eyes, "or maybe you could come to the city and visit me." "We’ll see," said Auntie Kathleen. Colin climbed up the steps of the train. He sat down and stared out the window. As the train chugged away, Duncan and Auntie Kathleen waved goodbye. Colin waved back. He sat silently the rest of the trip home. He thought about the adventures he’d been on and the treasure they found and was happy that he still had at least half of the reward money left. He remembered fishing and his first trout. Colin could almost taste the big, red, juicy tomatoes he’d grown and picked from the vegetable garden. Pink, purple, red, yellow and orange danced in his head as he thought of the flowers he’d grown and cared for. Never would he forget the beautiful purple heather and how it blanketed the hills. He chuckled, thinking of how soft and squishy the cow’s felt when he milked them. What a wonderful summer that had been. Colin fell asleep with visions of sheep and the soft, fluffy wool of their fleece. He would remember this summer forever.